Shaquem Griffin addresses the media. 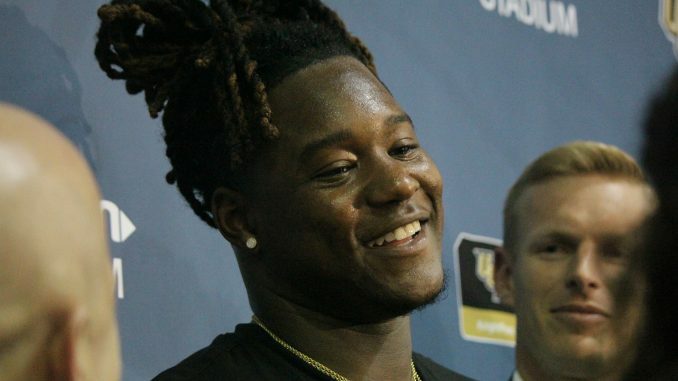 After a long wait, former UCF linebacker Shaquem Griffin finally heard his name called at the 2018 NFL Draft, being selected by the Seattle Seahawks with the 141st pick. Griffin, who will be joining his twin brother Shaquill in Seattle, made national headlines not just for leading UCF to a perfect season, but for doing so with one hand. The missing hand didn’t hinder Griffin at all in his time with UCF, as he was one of the team’s most impressive players over the last two seasons, taking home the AAC Defensive Player of the Year award in 2016. Griffin was the fourth Knight to be drafted this year, after Mike Hughes, Tre’Quan Smith and Jordan Akins. UCF has a long history of following up milestone seasons with bad years. Will 2018 break that trend?